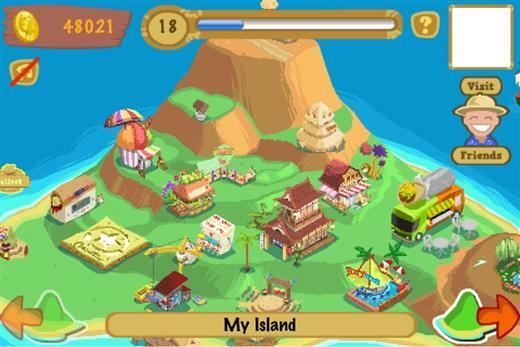 The object of the game in Happy Island is to create a tourist economy on a small plot of land jutting out of the ocean. Every player starts the game with an airstrip and a dock to welcome visitors to the island, as well as a small handful of attractions and decorations. As tourists visit each of these attractions they’ll pay a small fee to enter. 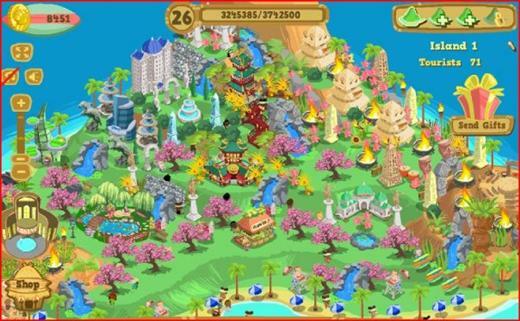 Raise enough money from these little visits to upgrade your attractions or purchase new ones, which in turn will attract more visitors to the island. Coins, as mentioned, are earned by your attractions. But merely having the attractions set up isn’t enough to get the coins into your bank. You’ll need to visit your attractions regularly and empty out their cash tills if you want to have that money to spend.